Um..what the what, what? Are we missing something here? 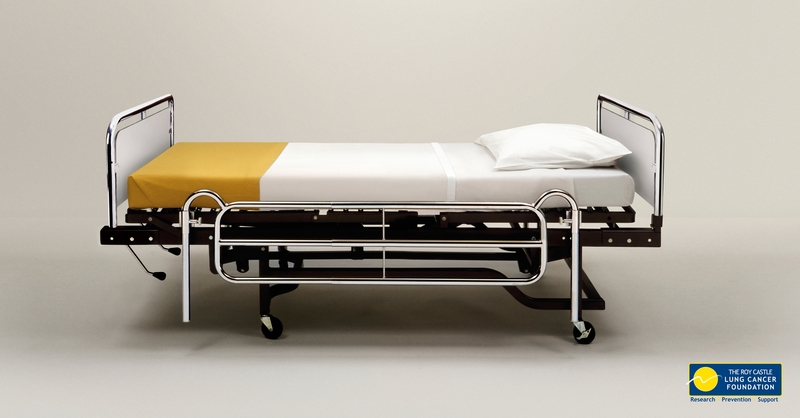 We're all for a good cause but we've looked at this Chi & Partners-created ad for the UK's Roy Castle Lung Cancer Foundation for quite some time and all we see is an empty bed. OK, so yes, we get that the empty bed signifies a person who's no longer with us but, really, this add is so clinical it could be for a hospital bed manufacturer. Could we have a headline? Tagline? Some heart string pulling copy? Or are we just too stupid to grasp the simplicity of this message? Yea, it's probably that. Supposed to mimic a cigarette, no? I also saw a cigarette. I haven't had one in eight years, but those things infect the brain forever. I would be willing to bet that smokers and former smokers are a lot more likely to see the cigarette; which is appropriate, since they're the target. I saw the cig right away. Likely because you asked me to look. But the agency ought to hire a copywriter to give this ad some persuasive energy. I too saw a cigarette right away. I don't feel that any copy is necessary, because if you cant identify with the ad or look to the lung cancer foundation logo, then obviously copy would not speak to you either. Yawn. Even smokers know this to be true. Cliches aren't enough any more. That spot that shows the mom on the phone worried about her daughter being sick was a solid example of moving things forward in the category. Turns out she's on the phone concerned but holding a cig.